Fabulous Frogger: Is it a HAED or a block of camouflage? It looks like a block of camo!! Looking at if farther away helps me see the leaves in the upper left corner, but up close I was getting worried about what I was stitching! Hoping to finish the other half of the page in the next few weeks. My phone camera doesn't take the best shots, or maybe it's my lighting....sorry about that. My last few posts have had some bad pics! I decided to update my WIPocalypse list, knowing that my time will also be spent on my new sewing machine. I moved a bunch to a "delete" list for now...possibly adding them back in mid-year if things are looking good. I also updated the ones I'm going to work on with specific goals (since they're mostly all HAED pieces, I made page goals). Has everyone finished putting their list together? In my last blog post, I had begun my adventure of making a quilt with my new sewing machine. After searching on the internet for various patterns, I decided to make a Cathedral Window quilt.....and of course I decided to make it big! Here's a link to the tutorial for the baby version: Cathedral Window Baby Playmat. My big version had me cut out 420 circles of fabric and 210 circles of batting! Who knew circles would be so difficult and time consuming to cut? Now I just need to pair up the fabrics (trying not to get any duplicates) and pin the batting on....then I get to start sewing! I'm loving how much stitching everyone is doing already!! I think it's the Crazy January challenge that folks are participating in. Maybe I should have signed up for that one! Your updated WIPocalypse list looks a lot more reasonable. I have mine finished for now. There are at least a million more pieces I want to add to it but I think I'm sticking with this for now. I know I will add more when I do have a finish. Good luck on the quilt. Holy cow that's a lot of circles! I used to quilt but can't anymore due to my back. I sure do miss it!! Love the starts on the HAED's! 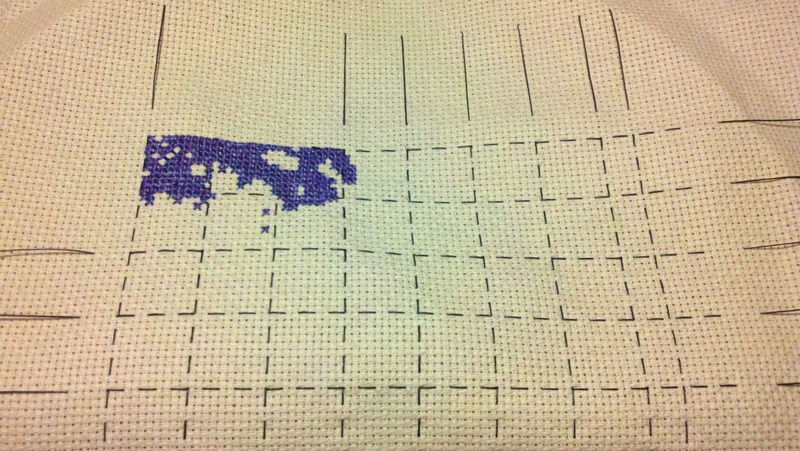 Great progress on your wips. 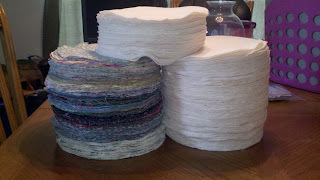 You have a LOT of quilting circles. Camo, LOL, I bet within 200 or more stitches it will be revealed! great progress on your wips..
Oh gosh, I LOVE Jonathon Earl Bowser and I'm so excited to see you do one of his pieces! Great job on the diet! Send a little success in that department my way! That certainly looks like camp to me! But I'm sure eventually the bigger picture will be revealed! Congrats on being down 25lbs so far! That's a lot of hard work! 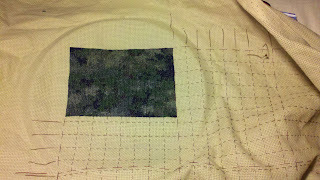 Great going on your WIPs, and oh my... that's a LOT of circles. Can't wait to see the quilt take shape. So glad that I found your blog, I'm impressed by your organised thread box. Looking forward to following your projects.